NWPCG is a non-profit organization formed exclusively for educational, artistic and charitable purposes. 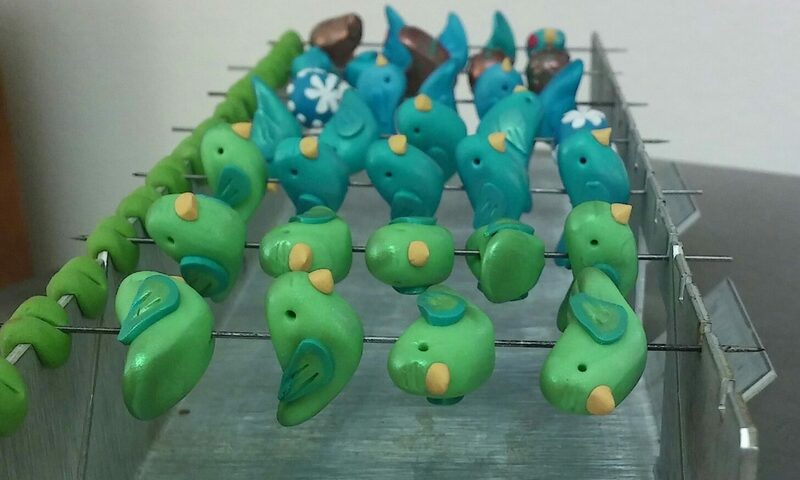 Our membership is open to everyone interested in working with polymer clay. Please check our Events page for all the exciting activities we have planned. In 1994 under the umbrella of the NW Bead Society, the NW Polymer Clay Artists formed and soon decided to hold its first ever conference on the art of polymer clay. Karen Murphy, then-president and founder of our group, and Maggie Maggio, Vice President, were at the helm together with Natasha Flechsig, (creator of the famous Natasha bead) and Gail Ethier (the first Guild newsletter editor). Before jumping in to do a conference, it was decided to try a test event in 1995 and call it Clay Camp. The first Camp was held at Camp Long in West Seattle. Sixty-five people from in and out of the USA came! Attendees included Klew (Karen Lewis) from Tehachapi, CA, Dan Cormier and Tracy Holmes from Canada, Tom Plattenberger from Anchorage, AK, Joy Zuke from Fairbanks, AK, Judy Summer from UT and a host of other people from different states. Cynthia Toops designed the Camp tote bags and T-shirts (I still have mine!). The response and results were so positive that it was decided to go ahead with the conference. At that time, the group also changed its name to NW Polymer Clay Guild (NWPCG). The first ever, week-long conference on the art of polymer clay was born: Convergence at Ravensdale. Held in 1996 in Ravensdale, WA, the event had a total of 196 hours of class programming and 265 participants attended! Teachers included many that we now regard as household names in the art of polymer clay: Kathleen Dustin, Nan Roche, Kathy Amt, Tory Hughes, Ford and Forlano (City Zen Cane), Cynthia Toops, Judith Skinner (Skinner blends), Klew, Kathy Dewey, Susanna Oroyan, Barbara McGuire, Donna Kato, Pier Voulkos, Lindly Haunani, Linda Goff, Laura Balombini, Susan Hyde and many others. After that huge success, it was decided to run Clay Camp every other year, alternating with the Ravensdale Conferences so NWPCG was running an event every year from 1995 through 1998. The second Clay Camp was held in Carnation at Camp Don Bosco. Again, people came from surrounding states. A host of gals from the San Diego Polymer Clay Guild attended, including Marie Segal, Syndee Holt and Klew. Many of them had dyed their hair red a la Marie style. It was hilarious! Shelly Crossen from Vancouver, WA attended the second Camp as a complete newbie to polymer clay and went on to start the now-defunct Portland Polymer Clay Guild. Later Cathy Johnston, an attendee at the first Clay Camp and many others went on to begin the Eastern WA Polymer Clay Guild as a sister guild to NWPCG. In 1997, I began to run Clay Camp and continue to oversee it to this day, 20 years later. In 1999, Clay Camp was moved to its present location at Camp Huston in Gold Bar, WA and has since then been held there every year even in a conference year, so NWPCG could secure the same annual dates. Over a span of seven years, NWPCG ran 11 events between the annual Clay Camp and Ravensdale every three years. After Ravensdale 2006 planning began for Ravensdale 2009 but the economy of 2008 made us realize it wouldn’t be fiscally responsible to continue with our plans. Later, upon further review, so many new events similar to Clay Camp developed that NWPCG didn’t feel that further Ravensdale conferences would be able to pay for itself so they were discontinued. NWPCG made history with the first conference about polymer clay in the world and changed the face of polymer events worldwide by creating the first ever “community work area” which we still have at every Clay Camp. About seven years ago or so, it was decided to start including classes in Clay Camp. Classes have been taught by highly skilled and talented teachers such as Susan Hyde, Marie Segal, Nan Robkin, Kim Day, Bea Grob, myself and others. Topics ranged from creating polymer ‘fabric’, translucent clay techniques, canes, making books, doll-making, metal clay, and even printmaking. Over the years people have come, gone and returned. Sadly, some have passed away: Terry Murphy (our founder’s husband and our original money guy); Jean Nicolaysen, a wizard with imitative techniques who fooled rock hounds; Linda Goff, ever the experimenter and known for her wire embedded in polymer jewelry techniques; and recently, dear Cheryll Simmons, a wise and wonderfully enthusiastic woman and clay creator. The NWPCG scholarship fund is known as the Murphy-Goff Memorial Fund and it supports people who want to attend NWPCG events but have financial limitations. The Fund represents the generosity of all those who have shared their time, enthusiasm, knowledge and love of creating art with polymer clay with us and have passed on. We are all incredibly richer from sharing with each other and for having known such wonderful people. The best way to honor them, is by remembering our history and helping others be able to come and participate in events hosted by NWPCG so we can continue this tradition of sharing. About the Author Meredith Arnold is a Comedian Artist and the Director of ArtWorks.